When Liza Hirsch graduated law school her first client was a Black worker in Laurel who was discriminated against by that same company. Liza won the case and Ginny glowed with full circle pride. Ginny avoided the spotlight but always did the vital and unseen work backstage of unfolding social dramas, such as weekly picketing of Woolworth against Jim Crow policies, a civil rights march to San Francisco, building the grape boycott, fundraising for the farm workers, helping and harboring draft resisters, organizing for the demise of the House UnAmerican Activities Committee, organizing the first San Jose demonstration against war in Vietnam. (The main speaker in that rally, Bill Mandel is here today, as is Luis Valdez who added drama to the action by leading a group to take over our Federal Building - then the Post Office. The signatories which included William Mandel Author, urged Congress to act on North Korea's Concerns. 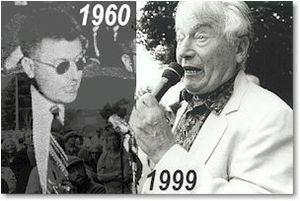 In 1992 William Mandel, broadcaster KPFA, Kensington, California endorsed the Committees of Correspondence national conference Conference on Perspectives for Democracy and Socialism in the 90s held at Berkeley California July 17-19. At the Committees of Correspondence conference, Berkeley California, July 17-19, 1992, was a candidatefor the CoC National Coordinating Committee-from Berkeley, Author and radio commentator. In the mid 1990s William M Mandel wasa contributing editor to Oakland based Institute for Social and Economic Studies- sponsor of CrossRoads magazine, which sought to promote dialogue and building new alliances among progressives and leftists... and to bring diverse Marxist and socialist traditions to bear while exploring new strategies and directions for the progressive political movements. In 2009 William Mandel Journalist and Activist was listed as a signer of the Progressives for Obama website.